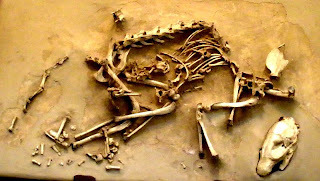 Fossil skeleton of Hesperocyon gregarius, one of the earliest species of Canidae. Photo from Wikipedia. Wild dogs, it has to be said, are often something of the poor relation among large carnivorans. While people ooh and aah over lions and tigers, are fascinated by bears, and giggle madly at otters, dogs tend to be given the cold shoulder. This has almost nothing to do with the subject of this post, other than that I am writing about dogs here, but it was a point I wanted to bring up. The Canidae are one of the more basally-diverging groups of living carnivorans. Within the crown Carnivora, the first divergence is between the Feliformia on one hand, containing cats, mongooses and hyaenas, and the Caniformia on the other, containing dogs, bears, seals and weasels. Then within the Caniformia, the first divergence is between dogs and everything else. Fossils assigned to the Canidae date back to the late Eocene, nearly forty million years ago. However, these fossils all belong to extinct subfamilies, and the earliest members of the Canidae crown group don't appear until the later part of the Miocene, about ten million years ago (Wang et al., 2004). All modern canids belong to the subfamily Caninae. The African hunting dog (Lycaon pictus), Asian dhole (Cuon alpinus) and South American bush dog (Speothos venaticus) have been suggested to form a separate subfamily Simocyoninae on the basis of dental characteristics (they have only one cusp on the heel of the carnassial teeth instead of two as in other Caninae - Macdonald, 1984), but these species are not closely related (Bardeleben et al., 2005) and their shared dental features are probably independent adaptations to a more hypercarnivorous diet (I suspect it may also be related to their hypercarnivory that these three species seem to be the most obligately social of the canids). Just to further nail the coffin for the "Simocyoninae", the type genus Simocyon is itself unrelated to the modern species. It's not even a canid, but a fossil relative of Ailurus fulgens, the modern red panda (Salesa et al., 2006). Reconstruction of two Epicyon species (Borophaginae) from Wang et al., 2004. The two extinct subfamilies of Canidae, Hesperocyoninae* and Borophaginae, both diversified soon after the origin of the Canidae in the early Oligocene. 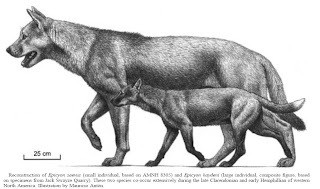 The Hesperocyoninae were mostly relatively small (the largest, and the latest, of the hesperocyonines was Osbornodon fricki, which reached the size of a small wolf). Most hesperocyonines were hypercarnivorous, and the subfamily was never hugely diverse. They became extinct during the Oligocene, shortly before the diversification of the Caninae. The Borophaginae were a much more disparate bunch. The subfamily is best-known for the giant, hyaena-like, bone-cracking forms in the genera Epicyon and Borophagus (the latest species of Epicyon, E. haydeni, was the size of a large bear and the largest canid ever), but the borophagines actually covered the entire range of canid ecological diversity from large to small, from extreme hypercarnivore to extreme hypocarnivore. One borophagine genus, Cynarctoides, appears to have been completely herbivorous. Borophaginae became extinct about two million years ago at the end of the Pliocene. *Hesperocyoninae as a whole may be paraphyletic with regard to the other subfamilies. But if I read Wang et al. (2004) correctly, it looks as though the majority of hesperocyonine genera (except, annoyingly enough, Hesperocyon itself) may still form a clade. 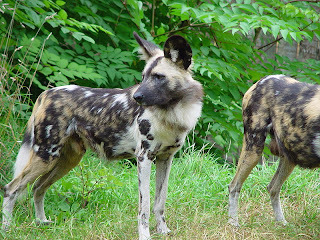 African hunting dog, Lycaon pictus. With their stick-thin legs and oversized ears, I've always felt hunting dogs look a bit like a young child's drawing of a dog brought to life. This photo is by Philip Gabrielsen, but an absolutely incredible (and more than a little creepy) photo of a pair of hunting dogs and a hyaena can be found here. The Caninae did appear at about the same time as the other two subfamilies, but in contrast to the immediate radiations of the Hesperocyoninae and Borophaginae, the Caninae barely trickled along for the next thirty million years in the form of a series of small, conservative species all assigned to a single genus, Leptocyon. The Leptocyon lineage didn't diversify until the extinction of the smaller borophagines. As discussed in an earlier post, the basic division between crown canids is between Vulpes (most foxes) on one hand and a clade containing the wolf-like and South American canids on the other, with the positions of the grey foxes (Urocyon), bat-eared fox (Otocyon megalotis) and tanuki (Nyctereutes procyonoides) relative to this split more uncertain. While not quite as diverse as the borophagines, modern canids are still an ecologically varied bunch. Anyone who has ever owned a dog can probably vouch for their tendency to try and eat anything that is physically capable of getting down their throat (and a few things that aren't), and many dog species are omnivorous to some degree. Perhaps the most extreme example is the maned wolf (Chrysocyon brachyurus), which feeds on fruit about as much as it does on meat (Dietz, 1984). There's a lot more I could write about here - the taxonomy of dingoes and singing dogs, and of the wolf complex in general, the origins of the red wolf (and how the ICZN fumbles on hybrids), and the natures of Dusicyon australis and Dusicyon hagenbecki, just for starters. But I've used up a morning already, so maybe I'll get back to them in a future post (I said maybe). Bardeleben, C., R. L. Moore & R. K. Wayne. 2005. A molecular phylogeny of the Canidae based on six nuclear loci. Molecular Phylogenetics and Evolution 37 (3): 815-831. Dietz, J. M. 1984. Maned wolf. In All the World’s Animals: Carnivores (D. Macdonald, ed.) pp. 74-75. Torstar Books Inc.: New York. Macdonald, D. W. 1984. The dog family. In All the World’s Animals: Carnivores (D. Macdonald, ed.) pp. 48-49. Torstar Books Inc.: New York. Salesa, M. J., M. Antón, S. Peigné & J. Morales. 2006. Evidence of a false thumb in a fossil carnivore clarifies the evolution of pandas. Proceedings of the National Academy of Sciences of the USA 103 (2): 379-382. Wang, X., R. H. Tedford, B. Van Valkenburgh & R. K. Wayne. 2004. 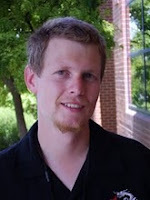 Ancestry: Evolutionary history, molecular systematics, and evolutionary ecology of Canidae. In The Biology and Conservation of Wild Canids (D. W. Macdonald & C. Sillero-Zubiri, eds.) pp. 39-54. Oxford University Press. Also, can you do a general phylogeny of the Carnivora with dates and hypotheses and stuff? Do we have any idea why the borophagines snuffed it? I don't know. But here are some random thoughts based on what I've been able to find out. Van Valkenburgh et al. (2004) attributed borophagine extinction to Cope's Rule - a trend to increasing body size leading to over-specialisation. I'm not convinced that this is the whole story, but it does appear to be true that the smaller borophagines became extinct earlier than the larger, hypercarnivorous borophagines. The Caninae then diversified into the niches previously occupied by the smaller borophagines, excluding the larger borophagines from an "evolutionary retreat" back to smaller size. After that, it's largely a matter of odds - larger taxa tend to be inherently more extinction prone than smaller taxa, because they exist in smaller population densities. So the important question is not "Why did the borophagines become extinct at the end of the Pliocene?" but "Why did the smaller borophagines become extinct in the late Miocene?" Even if the diversification of Caninae played a part in the ultimate extinction of Borophaginae, I don't think they were directly responsible for the extinction of the smaller borophagines, because the Caninae diversification doesn't appear to have happened until after the small borophagines shuffled off. The later Miocene seems to have been a period of faunal turnover all round, as the climate cooled and habitats became drier. The change in herbivore fauna that happened about then may have easily affected the carnivore fauna. That still leaves the small hypocarnivorous borophagines like Cynarctoides. Caninae have never become as fond of their veggies as the most hypocarnivorous borophagines, so why should they have disappeared? While the hypocarnivorous borophagines may have been affected by the change in climate, I would also be interested to know if there was any correlation between their decline and the diversity of procyonids, which first arrived in North America during the Miocene (borophagines and hesperocyonines were apparently both restricted to North America - I didn't realise that when I wrote the post yesterday). 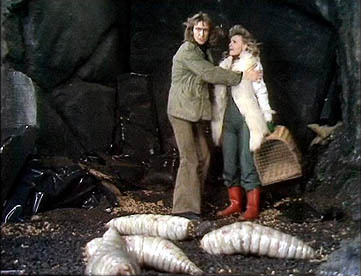 Could the procyonids have moved into the omnivorous niches the way the Caninae moved into the small carnivore niches?